So you like Scotch do you? Then I imagine you would have no reservation sharing a glass of inexpensive blended scotch whisky? All kidding aside, I do drink inexpensive blended scotch whisky on occasion! My first whisky that I actually drank on a regular basis was Ballantine. Then I graduated all the way up to Johnny Walker Red. After a few years of drinking blended whiskies I ventured into the single malt world and I admit, I pretty much prefer single malt scotch. The thing about drinking single malt is that I tend to get my head wrapped around the spirit, trying to dissect and figure out what makes it distinguished from another single malt. So there are times when I just don’t want to think, I just want to drink. 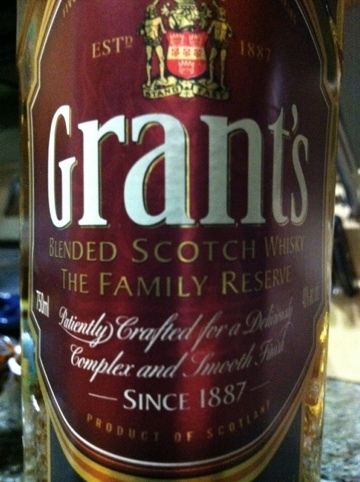 Enter Grant’s Family Reserve Blended whisky. I first saw this whisky somewhere, not sure, but it was the only scotch they had. That will probably say something about the establishment! So, hence, not exactly memorable. I could have had Jack Daniels, or some other common whisky but thought I must know what this Grant’s is about. I do remember thinking, not bad, and I’m sure I had a couple and I did not drown it in ice! Since then I’ve learned that this is one of the most popular scotch whiskies in the world! Sold in over 180 countries! And has been around since 1898. In sales I believe it is behind Johnny Walker (Red) and I think Dewar’s. I personally think it is equal to if not better than both of those offerings. The taste of it is complex but it should, being the result of 25 single malt and grain whiskies, the base being Girvan grain whisky. The tasting notes from the distiller highlight Pear and spring fruits. Ok, like a lot of tasting notes I find, I just nod and say, ok. Sometimes I can totally taste or nose what they are saying, the other 50% of the time I just nod. Though nosing is important and quite enjoyable on some whisky’s, this whisky is for drinking! As you can guess, this is an affordable scotch! And if you need a house scotch you should try this one out. If you are someone who actually mixes scotch (gasp) with other items then this might be a great staple for you. I have not tried the 12 year and up on this brand because it is not available in my area and I’ve never seen it at a tasting. The Master Blender for Grant’s also, just happens to be, the Master for The Balvenie. Now that should mean something. As an aside, this is my 100th post! Wow, a lot of typing and wondering if anyone would ever read this stuff! Well, if you are reading this I hope you enjoy! It’s my ‘go to’ Scotch. $14.99 at my local liquor store (The Wine Legend in Cherry Hill, NJ), can’t be beat. what can you mix this scotch with? because i can’t have it straight. I’m not a fan of mixing whisky unless I have a really experienced mixologist around. That being said, try adding a little clear or soda water to it until you can enjoy it.